Texas Hold’em by far the most popular form of poker online. Poker’s simplest variant contains just the right balance of skill, strategy and luck to keep the internet poker players hooked, and beginners gagging for more. From a full deck (52 cards), players are dealt two, face down ‘hole cards’. Between two (heads up) and ten (full ring) players can play. One player is always the dealer, and two players must always post blinds – small blind and big blind. There is a round of betting pre-flop (before the first three community cards are dealt). In No-Limit Hold’em, a player can move all-in at any stage. In Pot-Limit Hold’em, a player can only bet the ‘pot’ (money in the middle), or factors of the pot. In Limit Hold’em, a player can only raise one big blind. On his turn, a player has three options – he can fold (muck his cards), check (invest no further money) or raise (increase the pot size). After the first round of betting, the flop is delivered. There is another round of betting. After the fourth card, the ‘turn’, there is another round of betting. There is a final round of betting after the ‘river’, the fifth community card is dealt. The aim of the game is to make the best five card hand. The player who achieves this scoops the pot. 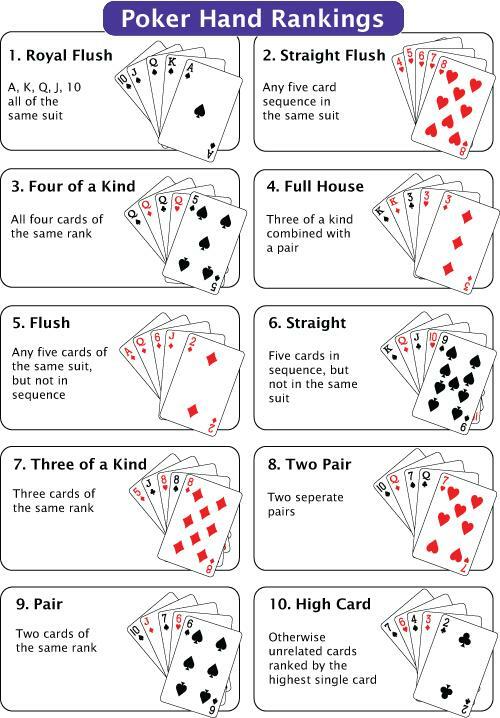 Here is a chart summarizing the hand rankings in Texas Hold’em. Of course, it is very rare you actually see a Royal Flush or Four of a Kind. The most common scenario is a player hitting a pair. If both players hit the same pair, then the pot is awarded to the person with the highest ‘kicker’. For instance, on a 5c 10d Jh 2s 7s board, Steve has Ac Js. His five card hand is Jh Js Ac 10d 7s, so in full word form, ‘a pair of jacks with ace kicker’. John holds Kd Jd. He holds a pair of jacks with king kicker, and so loses the pot. In Texas Hold’em, the ace can represent high or low. So you can make a straight, Ace to 5, and a straight 10-Ace. If both players table exactly the same hand, the pot is split. Now you know the basics, let’s look at how the game works in practice. 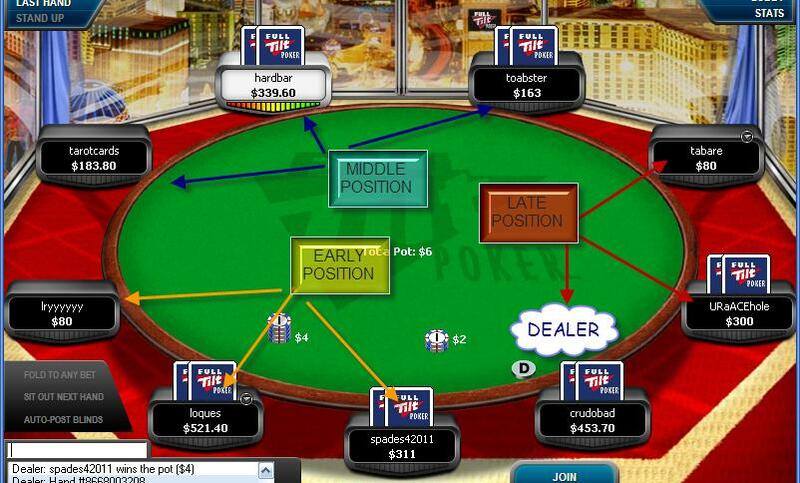 This screenshot is taken from a full ring (9 player) table on Full Tilt Poker, one of the biggest online poker sites. It may look confusing at first, but we’ll explain all the terms. This is a $2/$4 No Limit Hold’em game. This means that two players must post blinds of $2 (small blind) and $4 (big blind) respectively. In this case, ‘spades42011’ and ‘loques’ are the blinds. ‘crudobad’ is the dealer. Before the flop, ‘lryyyyyy’ is first to act. Therefore he is in ‘early position’ – he must act the ‘earliest’ before the flop. He has three options – he can fold (commit no money to the pot), flat call (call the big blind of $4) or raise. So why are loques and spades in early position? Although they act last before the flop, because they are on the blinds, they must act first on every other ‘street’ (after the flop, turn and river). Your ‘position’ is determined by your seat, in relation to the dealer. The dealer is always in late position, as he is the last player to act on the flop, turn and river. The later position you are in, the better. This is because you can adjust your actions to how people act before you. If you are in late position, you have more information on your opponents holding. A lot of Texas Hold’em is about selecting the right starting hands to play. For beginners, we advocate playing tight – this means only playing a small range of hands. Hands such as AA, KK and QQ are premium hands, and should be played very aggressively. Hands such as AK suited and JJ are also very powerful holdings. We should be more careful about playing hands like AQ, and pocket pairs such as 10,10 and 9,9, but they are still strong holdings. We should be very careful about playing marginal hands such as KQ, KQ, A10, as in a full ring game, it’s quite likely there is a superior holding. The earlier your position on the table, the tighter you should play, because there is a higher chance someone acting after you will have a better holding. There is also value in playing hands like suited connectors (6d 7d) in multi-way pots, because they have flush and straight potential. With these hands, you have the potential to rake in a big pot if you connect with the flop. You should only play these kind of hands if you are getting the right pot-odds (i.e. you stand to win a lot of money on your investment). This will be explained in more detail in later articles. If you want to try playing Texas Holdem for free online (i.e. playing in non-money games) we recommend you play at Titan Poker below with superb $500 bonus. On the otherhand, if you find some of this too complicated than I recommend playing bingo Bingo instead.